Want to learn more about the allowances you see in Keywords Explorer? You’re in the right place. 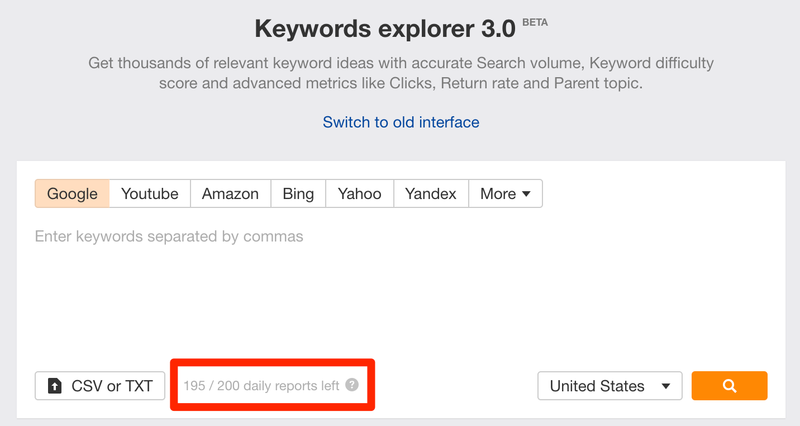 No matter whether you put a single keyword or a list of keywords (up to 10,000) into Keywords Explorer, it is counted as “one report”. Please see the daily limit for your subscription plan at the Plans & pricing page. We recommend that you research your keywords in batches so as not to overcome your daily reports limit earlier than necessary. By default, Keywords Explorer shows you a cached SERP (top 100 ranking pages) for the most popular keywords in our database (~473 million of them). This SERP can be anywhere from a few hours to a few weeks old, depending on the popularity of the keyword. Along with a fresh SERP, we will also recalculate Keyword Difficulty and update the Parent Topic for your keyword, as both of them depend on the top 10 ranking pages. NOTE: All other metrics (for e.g. 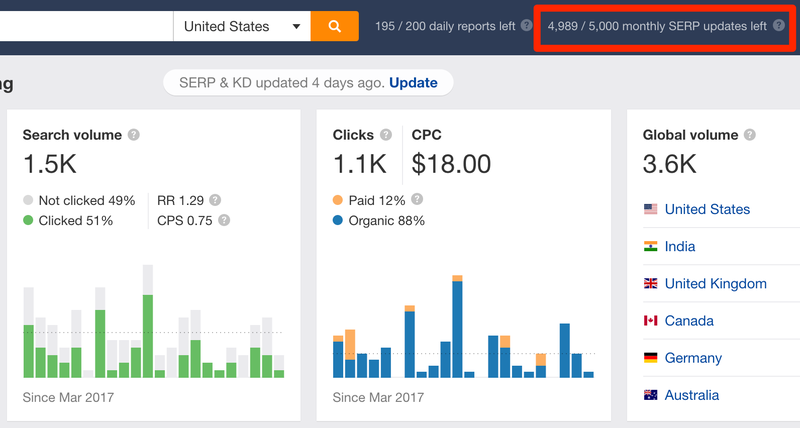 search volume, clicks, return rate) stay the same. Please see the monthly allowance of “SERP updates” for your subscription plan at the Plans & Pricing page. NOTE: Unused “SERP Update” do not roll over to the next month. What happens if I run out of “SERP Updates”? You can still use Keywords Explorer even if you run out of “SERP Updates”. The only difference: you will not be able to request a fresh SERP and will see a cached one instead. Do note that since we keep our cache as fresh as possible, you will likely see fresh SERPs for popular (i.e high search volume) keywords.